What are the things that remind you of life's beauty? Posted as part of Haiku Heights #53, Pink Saturday, Poetry Potluck #54, The Purple Treehouse, Recuerda Mi Corazon. simple perfection - it is lovely! Hope you have a fun pink weekend! He reminds me every single day that life is beautiful, despite what may occur during the day. I love this flower so much. You see a lot of them in Hawaii. Are they lotus? Beautiful words and beautiful photo. You are very lucky to have flowers such as this one. Beautiful, and beautifully photographed. Beautiful flower, beautiful haiku. What reminds me of life's beauty? Many things, I can't name just one as they change from moment to moment. I must admit though, I have to look for them in every moment as well. Picture and quote are beautiful! Thank you all for such beautiful comments. Gracias a todos. Yes, the lotus is my favorite flower of all. love the image you choose. So uplifting and soothing. Marvelous!! and your photo is fabulous. It's as though I could reach out and actually touch the real thing. So beautiful in words and picture! Welcome sharing your poetry with us today. Poems that are old but need more attention, poems related to nature and life are welcome. Hope to see you linked in and share. Beautiful picture made more alive with beautiful words. Nicely done! Beautiful haiku. It adds to the beauty of the image too :) Thanks for sharing! Hello Lola, 'tis good to find another Dharmafarer here. 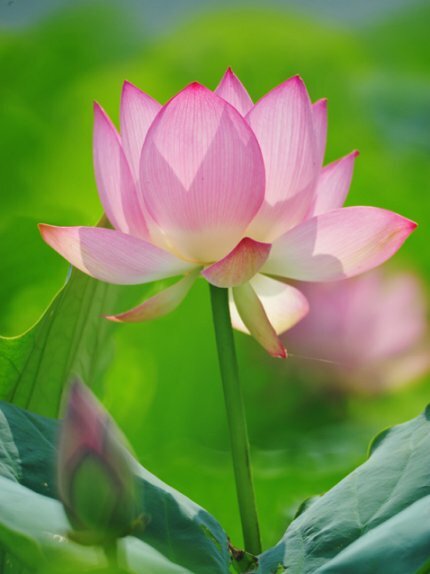 Your lotus greets the day - she is liberated.